Do you remember the days of cheesy re-enactment footage in documentaries? No name actors in bad wigs with distracting accents showing you what “really happened”? It was intended to fill in the gaps left by the “talking head” interviews, a little live action to spruce up the place. In 2018, the True/False Film Festival has featured some films that offer a whole new approach to the art of the re-enactment. In American Animals, the new film from writer/director Bart Layton (The Imposter), the audience is given a hybrid of speculative narrative film and on-camera interviews. How can it be speculative if the subjects of the film are participating in the documentary? Can’t you simply ask them about a particular event? Yes and no. Part of the intrigue generated by American Animals is due to its conflicting accounts of the events in question. 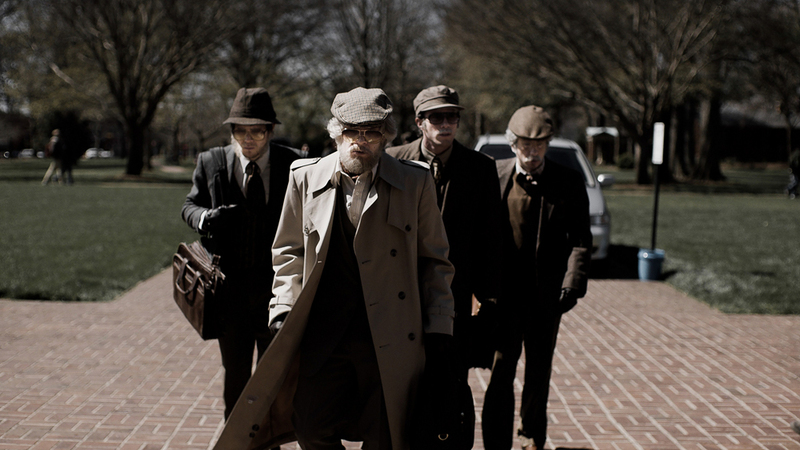 Some of the protagonists remember themselves in a better light than others, making American Animals a compelling exercise in unreliable narration. By the end of the film, we know what they say happened, but we’ve also been given some supposition in the narrative re-enactment that feels a little more accurate than what we’ve been told. In 2004, four college-aged kids attempted to steal a collection of rare books from Transylvania University in Lexington, Kentucky. The prize of the heist was an original edition of Audubon’s Birds of America worth millions of dollars. Security in the rare books room is minimal, and only one librarian stands in their way. They meticulously plan the caper, and as with all great battle plans, it all goes out the window upon first contact with the enemy. The film’s secret weapon is its stellar cast of actors: Evan Peters (X-Men: Days of Future Past), Barry Keoghan (The Killing of a Sacred Deer), Blake Jenner (Everybody Wants Some), and Jared Abrahamson (Travelers). Thanks to their fine work, the re-enactment segments are the most compelling parts of the film. Yes, at times the charismatic young cast can overshadow their real-world counterparts, but when your documentary is doubling as a heist thriller, their strong presence is required. Documentary purists may roll their eyes at some of the flashy technique on display when Brad Layton seamlessly blends the interview subjects with the re-enactment footage. In one moment, the four men barrel through a neighborhood in full disguise on their way to the heist, and they pass the real world Spencer Reinhard standing in his driveway. The haunted look on his face lets the audience know that he and his friends are about to make a terrible mistake. Heavy-handed? Maybe. Points for originality? Definitely. There is, however, a hole in the middle of American Animals, a piece of the puzzle that is glaringly absent. And for some viewers, it’s the ultimate question: Why? What motivated a group of four suburban white boys to leave behind their lives of college educations and frat parties to become art thieves? The interviews skirt the issue, focusing on the logistics of the heist rather than the motivations of the perpetrators. They simply took leave of their senses and did something foolish that cost them dearly. Or that’s what they’d have you believe. Because of this, American Animals feels a little incomplete, like the producers of the film let these four men off lightly. It’s like a courtroom cross-examination that ends just before Jack Nicholson admits he ordered the Code Red. They express remorse for their actions, but their claims that they were just a bunch of crazy kids doing what crazy kids do rings false. It leaves American Animals feeling a bit hollow. But, it’s still a ride well worth taking. American Animals will be released in June by The Orchard.